App Engine is a Platform-as-a-Service. It means that you simply deploy your code, and the platform does everything else for you. For example, if you app becomes very successful, App Engine will automatically create more instances to handle the increased volume. Compute Engine is an Infrastructure-as-a-Service. You have to create and configure your own instances. It gives you more flexibility and generally costs much less than App Engine. The drawback is that you have to manage your deployment yourself. You can mix both App Engine and Compute Engine, if necessary. They both work well with the other parts of the Google Cloud Platform. App engine saves tons of headache, especially for inexperienced people but it has 2 significant drawbacks: 1. more expensive (but it does have a free quota which compute engine doesn’t) 2. you have less control, thus certain things are just not possible, or only possible in one specific way (for example saving and writing files). Basic difference is that Google App Engine (GAE) is a Platform as a Service (PaaS) whereas Google Compute Engine (GCE) is an Infrastructure as a Service (IaaS). On the other hand, GCE provides you full infrastructure in the form of Virtual Machine. You can write or install any program in GAE virtual machine. Actually GAE is the way to use Google Data Centers virtually. In GAE you have to manually configure your infrastructure to handle scalability by usingLoad Balancer. rem Copyright 2013 Google Inc. All Rights Reserved. 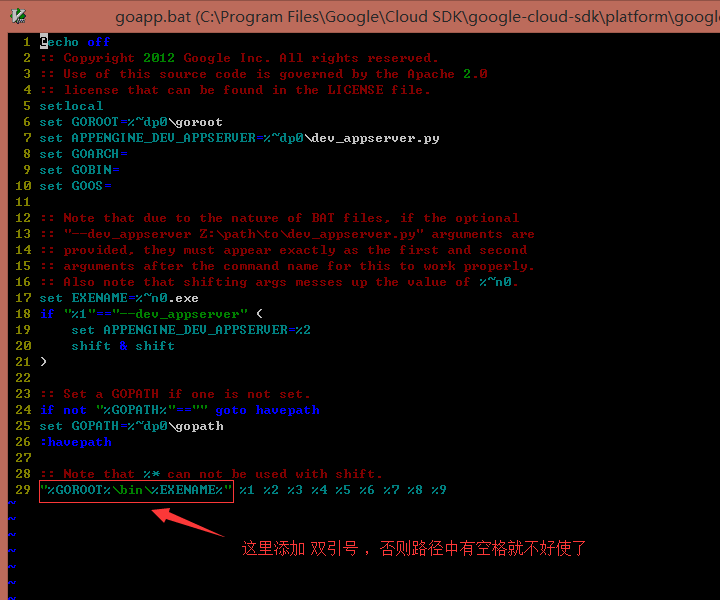 %COMSPEC% /C "%CLOUDSDK_PYTHON% %CLOUDSDK_ROOT_DIR%\bin\appcfg.py %*"